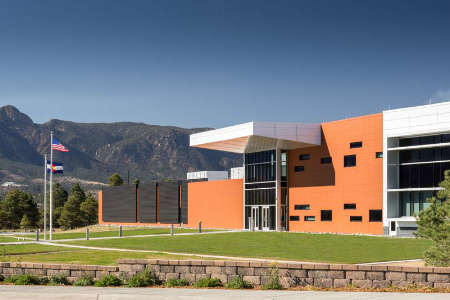 The new Readiness Center at the United States Air Force Academy in Colorado Springs was built to support an Infantry Heaquarters Company and included an assembly hall, classroom, library, learning center, simulation center, kitchen, family support center, recruiting office, ammunition vault, physical fitness center and restrooms. As Commissioning Agent, E Cube developed and executed the Commissioning Plan. This plan consisted of comprehensive, multi-stage commissioning process for the mechanical (HVAC), electrical, HVAC controls and lighting controls, telcom and fire/life safety systems. In addition, E Cube also provided Building Envelope Commissioning through ATI. For each piece of major equipment and combined system, this process included on-site pre-functional (installation phase) checkout procedures, test & balance review, functional performance checkout procedures, integrated system operation checkout procedures, operation and maintenance manual coordination and review, issue identification and resolution expediting, and management of all associated documentation. In addition E Cube performed a post-Construction warranty review. Commissioning activities concluded with a final report to the owner, which reviewed the results and included all documentation completed/collected during the process.